Whenever I come across something good, I like to pass it along to you. Have you bookmarked/visited Mary Corbet's website yet? It is called Needle 'n Thread. She has the most excellent video library of embroidery stitches as well as Tips & Techniques. Now, if you are saying... "I do needlepoint... I don't do embroidery"... you might want to re-think your statement. Do you do French Knots? Do you do Backstitches? Do you do Outline/Stem stitches? These and many more surface embellishment stitches began in the embroidery world and, lucky for us, are also used in the needlepoint world. Here is what is nice about Mary's website. You can sign up for her Daily Newsletter which comes to you via email; a highlight of my day. 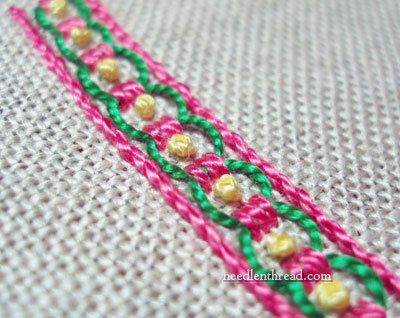 Today's newsletter was about the Guilloche Stitch. So pretty. Imagine it on a Stocking as part of the transition between the main design and the Name area. Work it in colors. Try it in Metallics. So pretty. 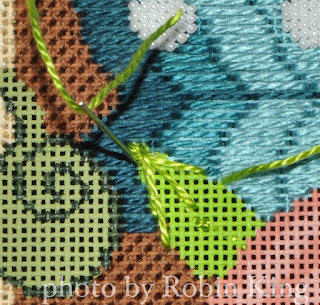 Mary Corbet provides step-by-step color photos of the stitch from beginning to end. Written tutorials. Sometimes, there is a video, too. Truly, a labor of love. It was on the Needle 'n Thread website where I found the inspiration for the leaves on the Flowers in a Vase (ND 311) canvas. Brilliant. Thanks, Mary! 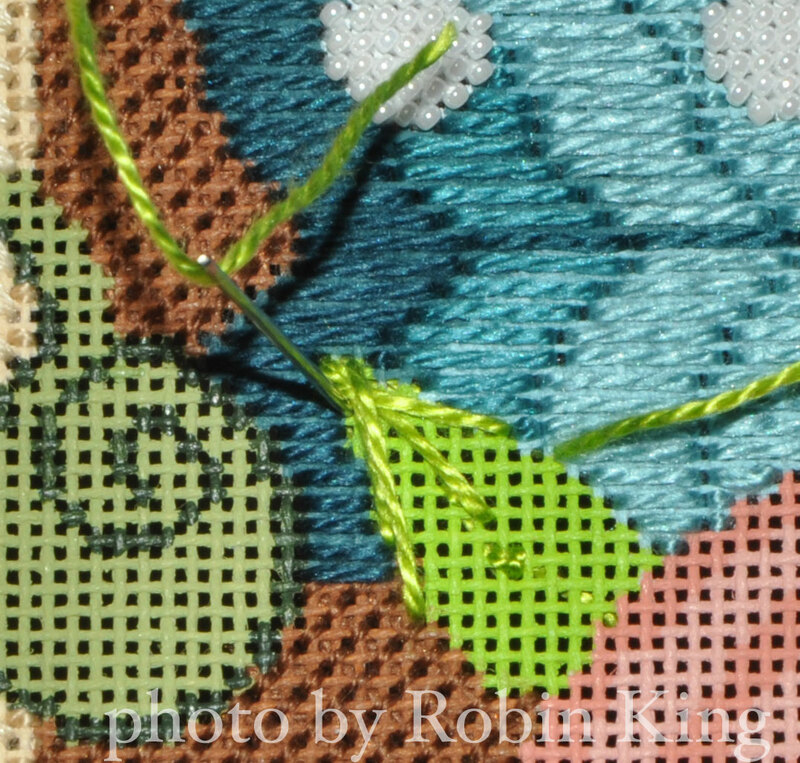 Can you name this stitch? Hi Robin! I found Mary Corbet's blog through the link on your blog. I agree that her teaching is fabulous, and I plan to use quite a few of her stitches in pieces I am working on and/or planning. Thank you! Great to hear from you. Love your location, too: Critter Cove. Actually, I might need to borrow it. LOL.